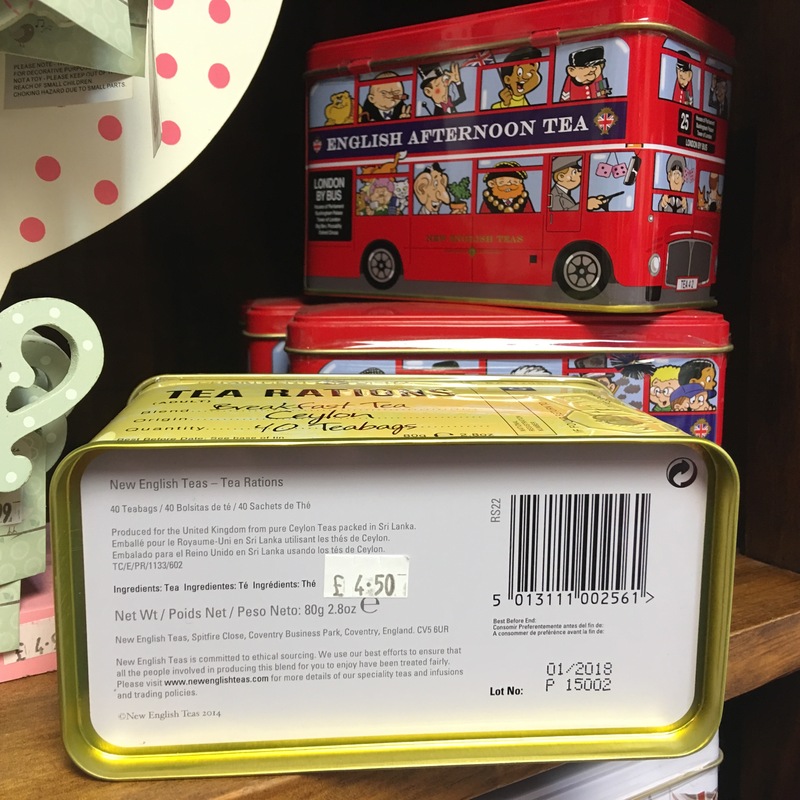 Keith Spicer Ltd, established in Bournemouth in 1934, source, import and blend teas from all over the world for many famous brands here in UK at either their Ferndown, Dorset or their North Shields, Tyne & Wear site – they bought the old Twinings site at Earl Grey Way (yes, really!) in 2012 after Twinings had decamped to Poland making c.260 employees redundant in 2011. Whittard of Chelsea stress their British heritage but as far as I can tell all their teas are all packed in Germany. 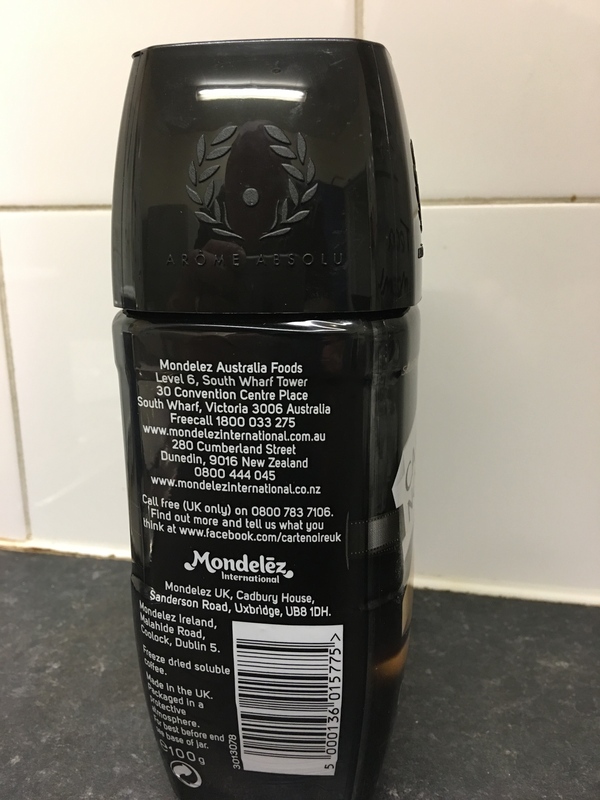 Some of their products do not even state the country of origin. They do though sell a very limited range British made tea pots and the like in their shops. 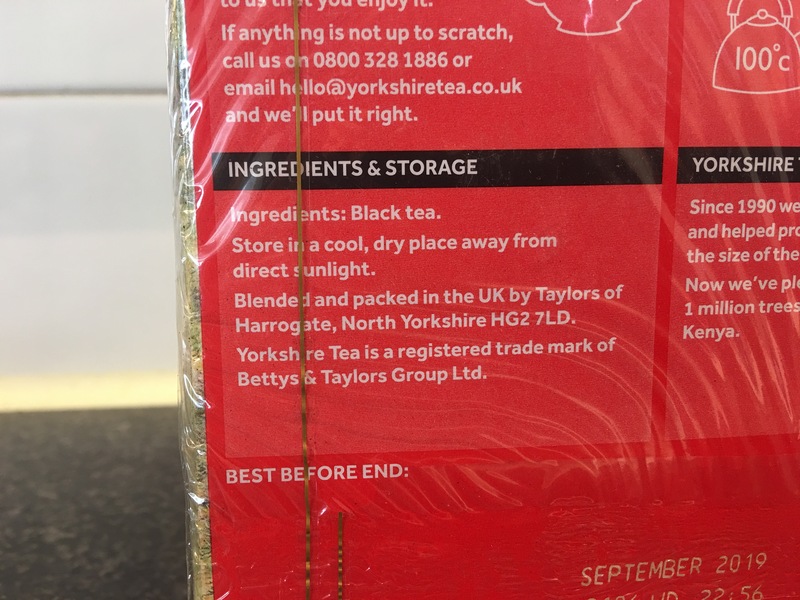 Yorkshire Tea, Betty’s Tea and Taylors of Harrogate tea (Bettys and Taylors of Harrogate Group) – http://www.bettysandtaylors.co.uk, http://www.yorkshiretea.co.uk – is all made in the UK as far as I am aware. The same goes for their coffee. Taylors of Harrogate Lazy Sunday Sunday ground coffee. Roasted and packed in the UK. Photograph by author. 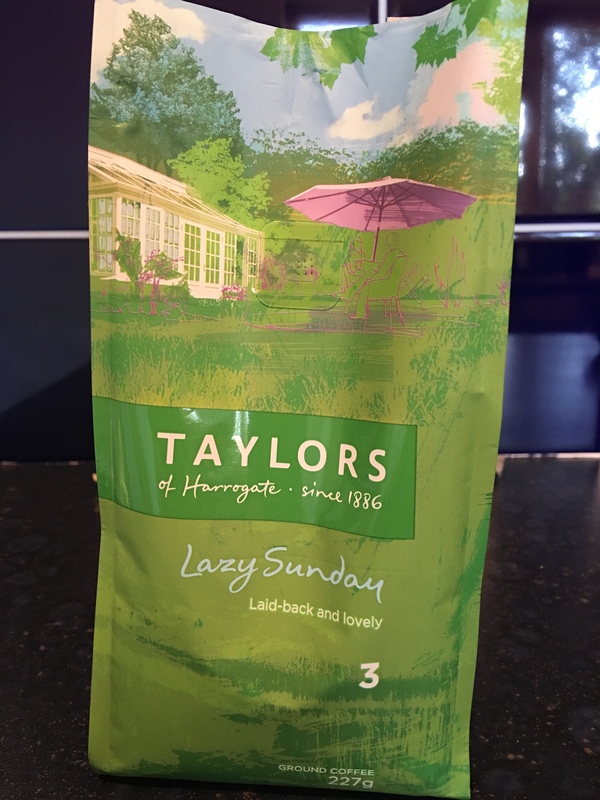 Taylors of Harrogate Lazy Sunday Sunday ground coffee. Roasted and packed in the UK. Rear label view. Photograph by author. 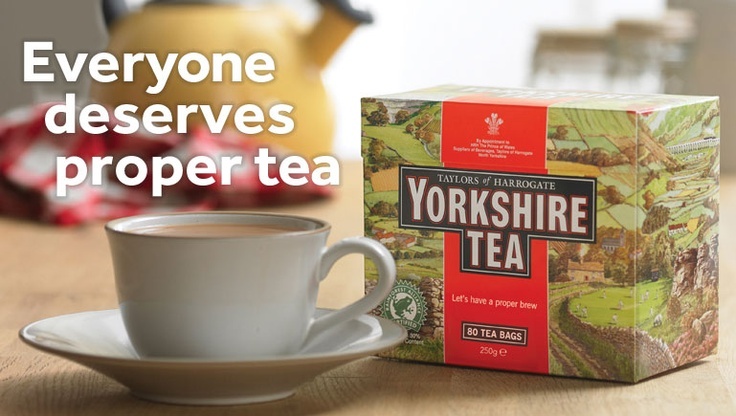 Taylors of Harrogate Yorkshire Tea bags. Blended and packed in the UK. Photograph by author 17 May 2018. 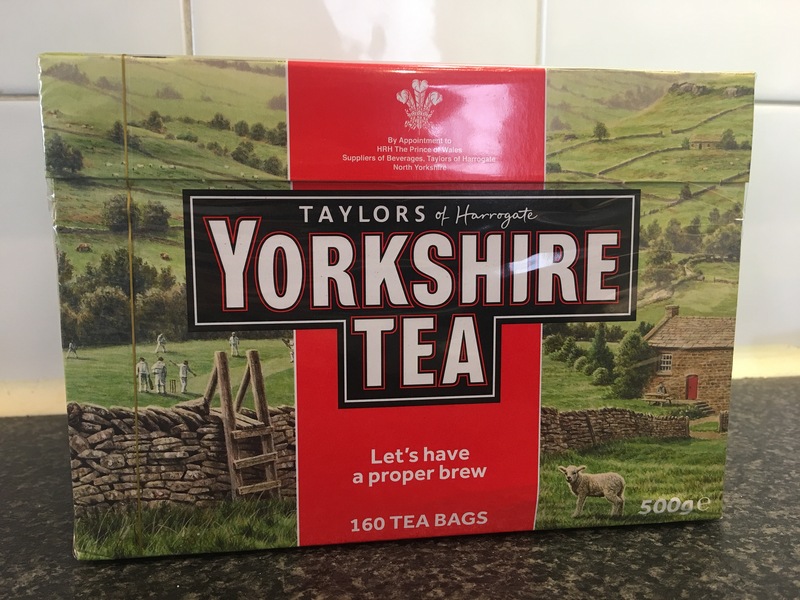 Taylors of Harrogate Yorkshire Tea bags. Blended and packed in the UK. Photograph by author 17 May 2018. Label detail. 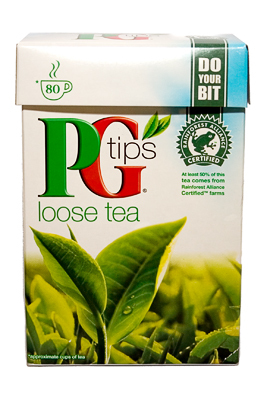 PG Tips loose tea. Blended and packed in Manchester, England (part of Unilever). 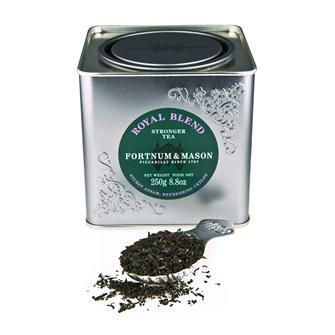 New English Teas Tea Rations gift tin. 40 tea bags. 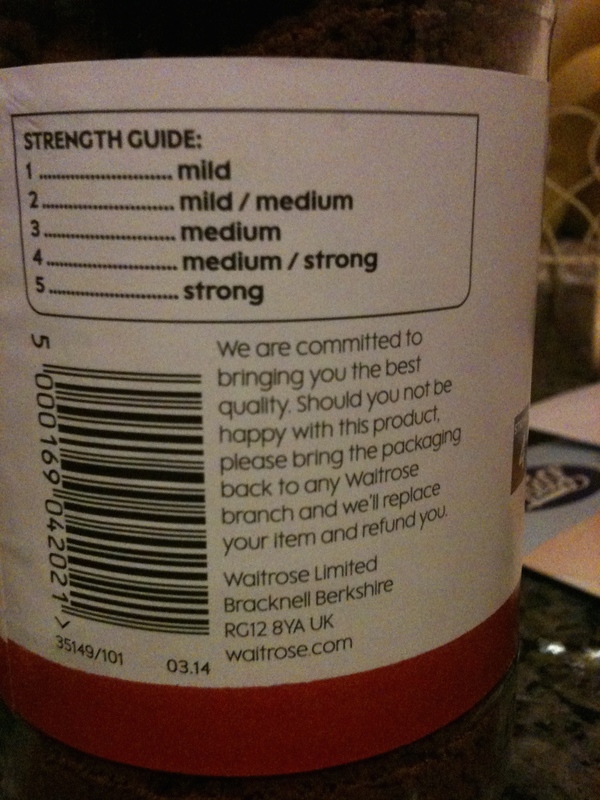 Produced in the United Kingdom. Photographed by the author in the Edinburgh Woollen Mill in Bourton on the Water. 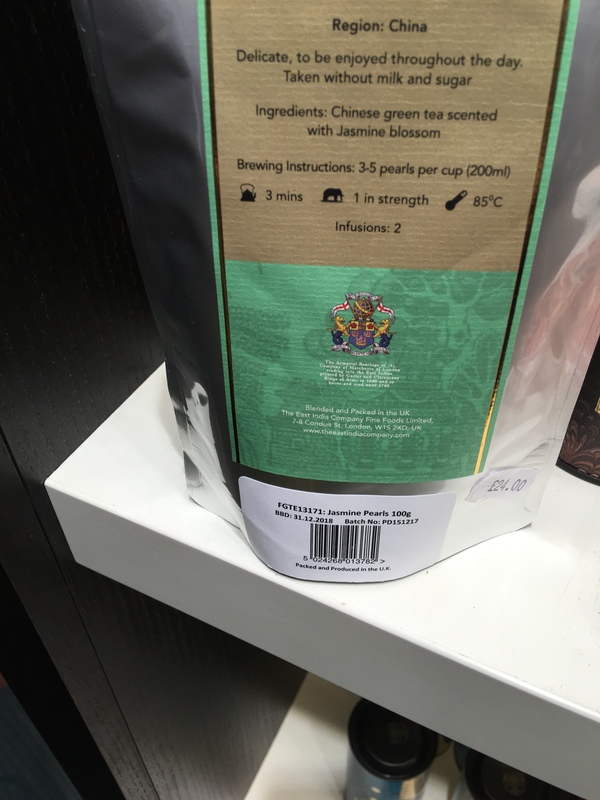 East India Company Jasmine Pearls Green Tea. Blended and packed in the UK.. Photograph by author. 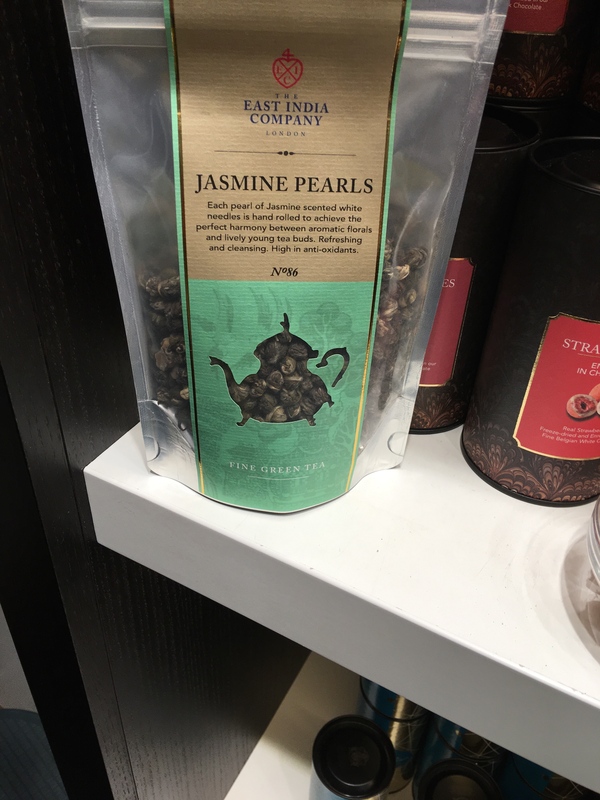 East India Company Jasmine Pearls Green Tea. Blended and packed in the UK. 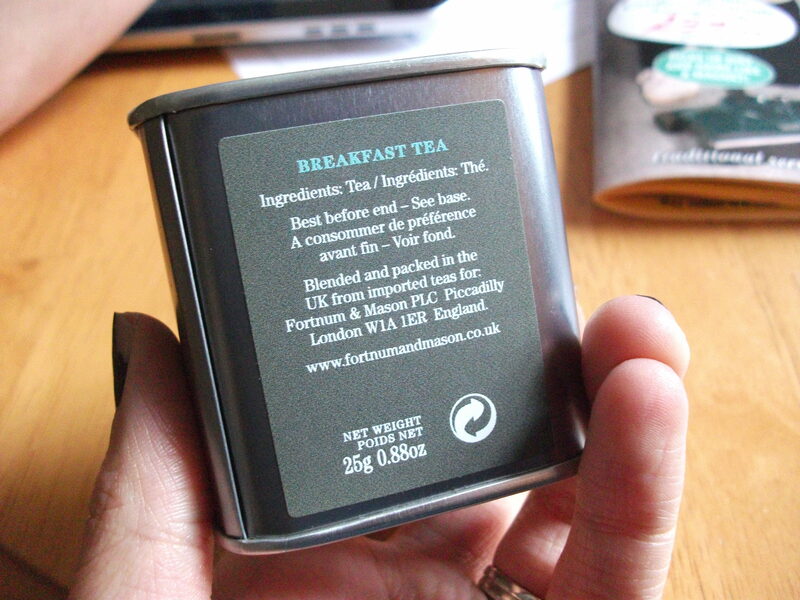 Rear of packaging label view. Photograph by author. 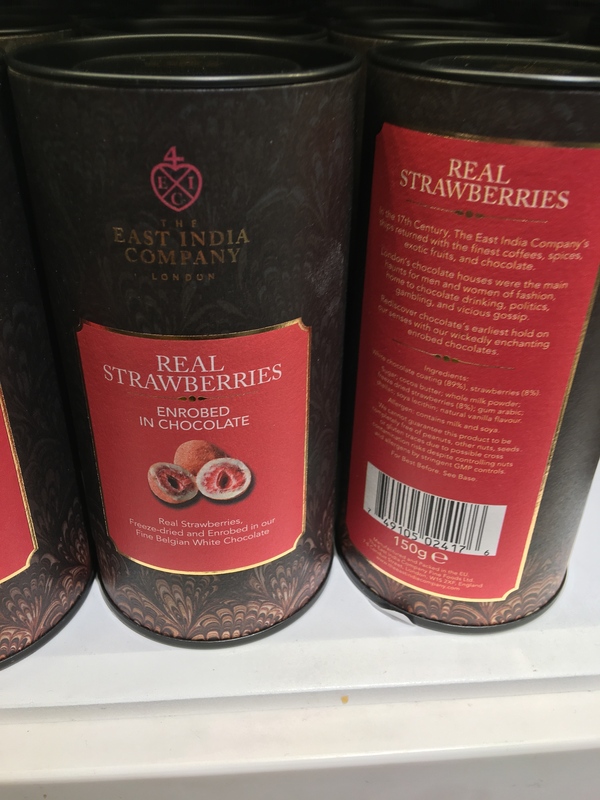 East India Company Real Stawberries in Chocolate – NOT made in the UK. Photograph by author. 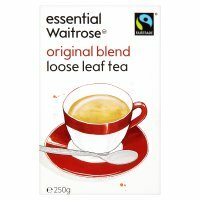 Essential Waitrose Original Blend – Loose Leaf Tea 250g. Packed in the UK. 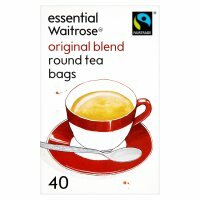 Essential Waitrose Rich Roast Coffee instant granules. Front view. Note country of origin is no longer given. Presumably this Waitrose coffee is now foreign made. 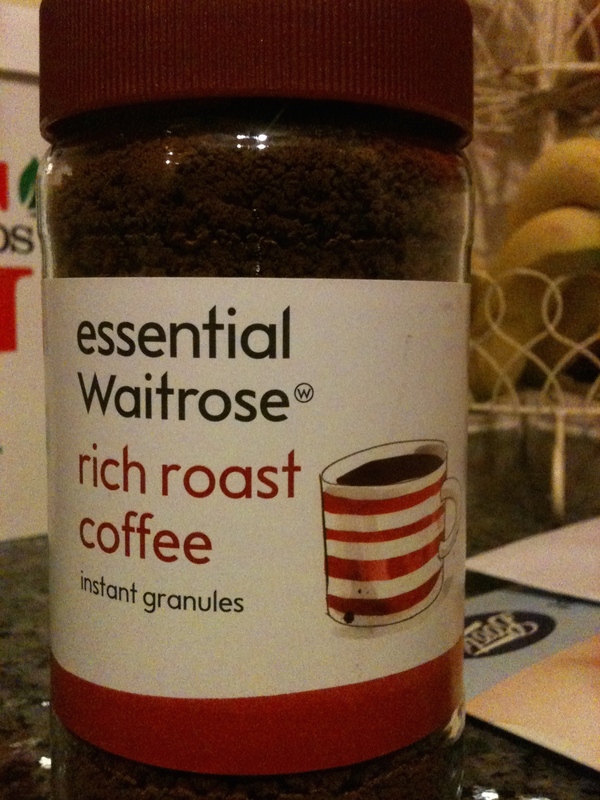 Essential Waitrose Rich Roast Coffee instant granules. Label view. Note country of origin is no longer given. 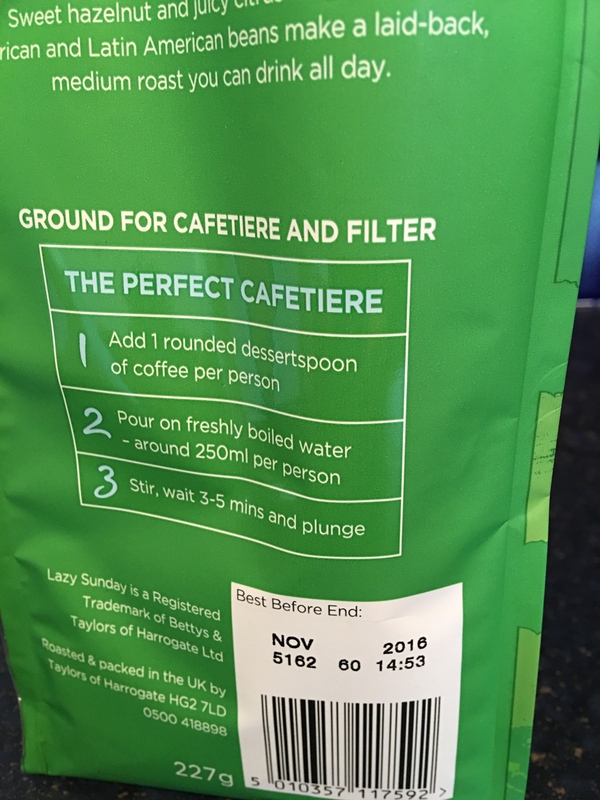 Presumably this Waitrose coffee is now foreign made. 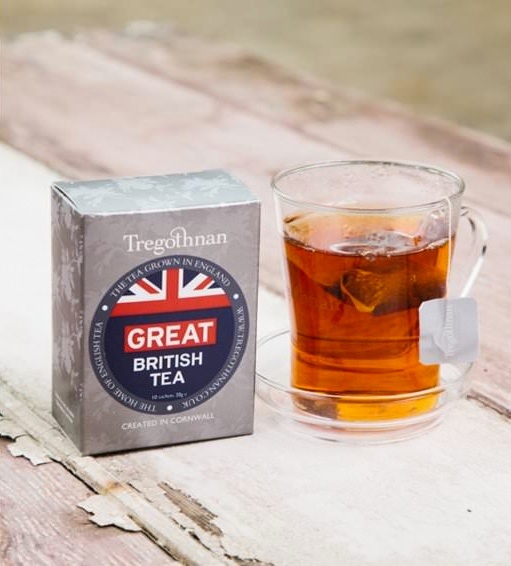 Tregothnan GREAT British Tea. Grown, blended and packed in England. Clipper drinking chocolate. Imported ingredients. Packed in the UK for Clipper Teas Ltd. No indication of where it is made. Photograph by author. 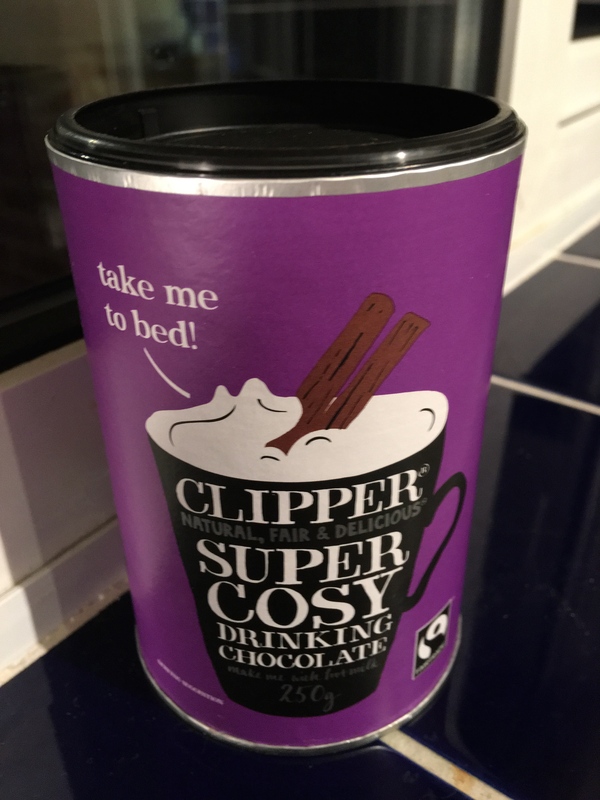 Clipper drinking chocolate. Imported ingredients. Packed in the UK for Clipper Teas Ltd. No indication of where it is made. Label detail view. Photograph by author. 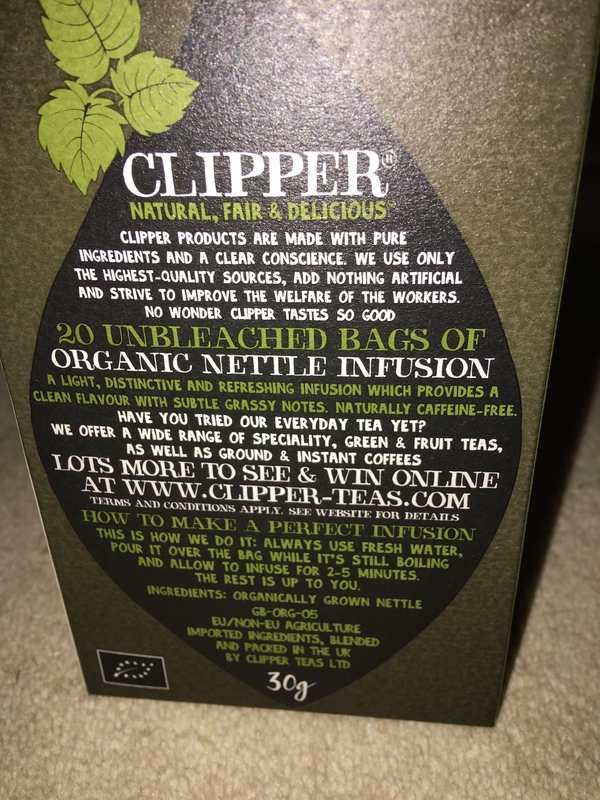 Clipper Nettle tea. EU/Non-EU agriculture imported ingredients. 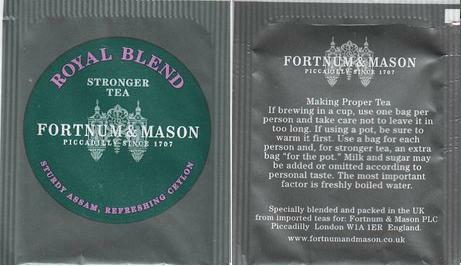 Blended and packed in the UK by Clipper Teas Ltd. Photograph by author. 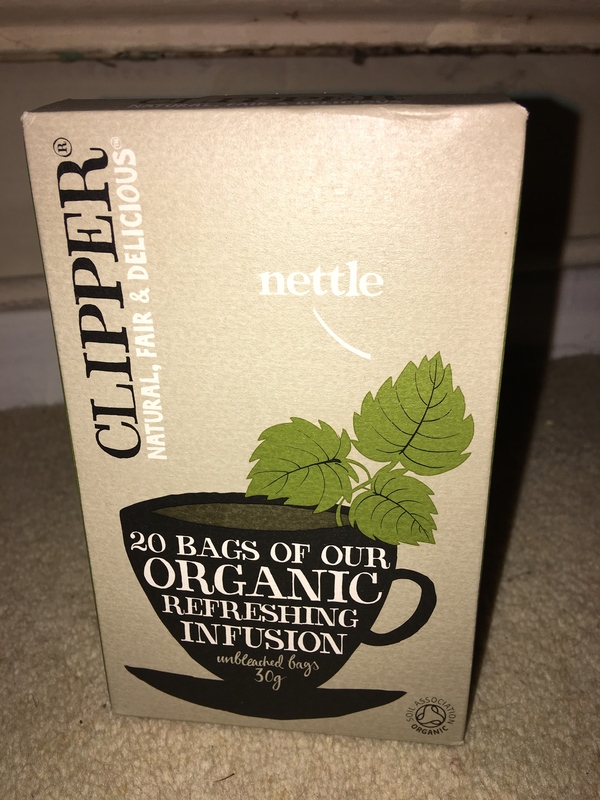 Clipper Nettle tea. EU/Non-EU agriculture imported ingredients. 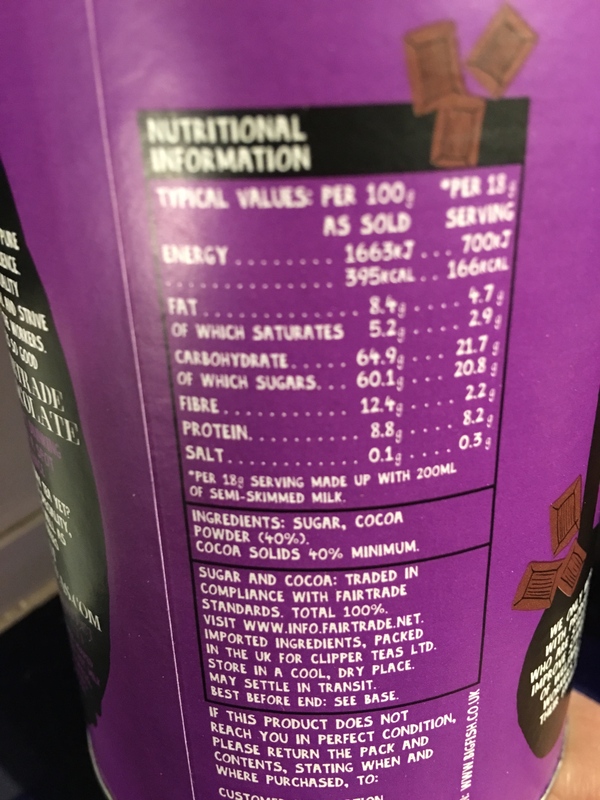 Blended and packed in the UK by Clipper Teas Ltd. Label view detail. 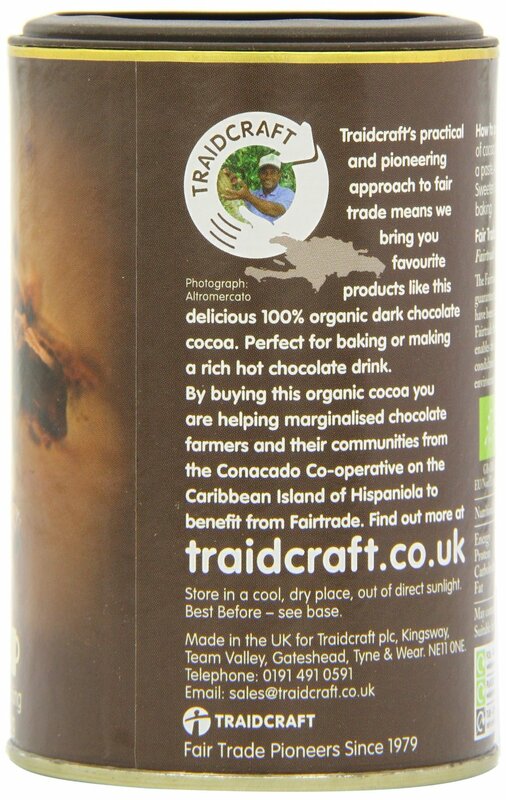 Traidcraft Organic Fairtrade Cocoa 125 g. Made in the UK. 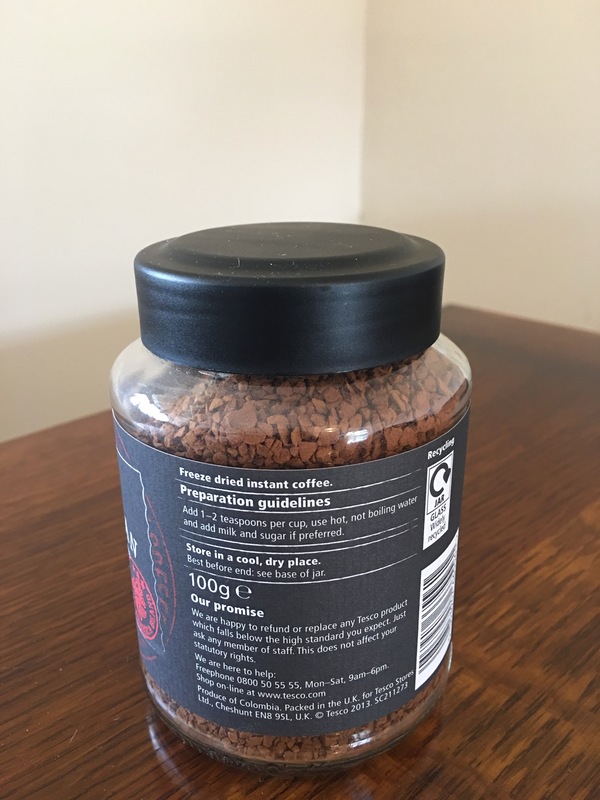 Beanies Amaretto Almond flavour instant coffee is made in the UK for Beanies. Photograph by author. 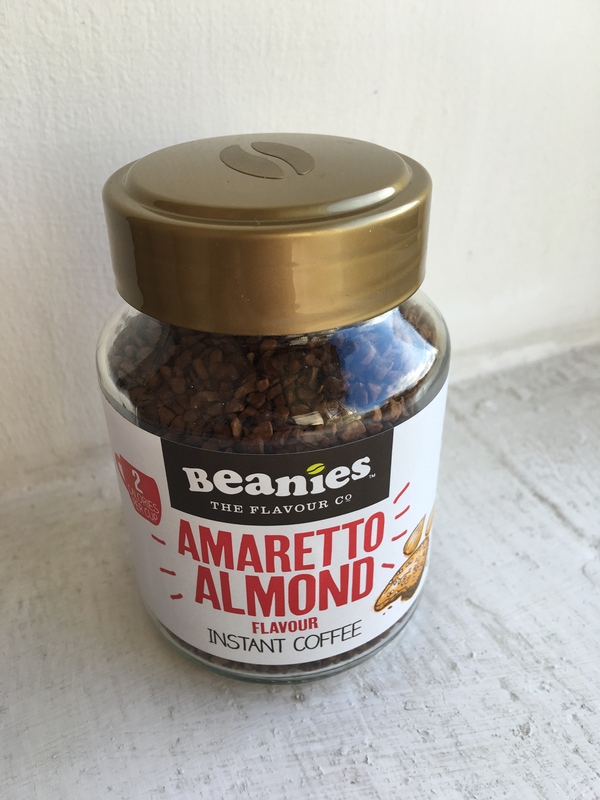 Beanies Amaretto Almond flavour instant coffee is made in the UK for Beanies. Rear label view. Photograph by author. Mondelez Carte Noire Classic instant coffee. Made in the UK. Photograph by author. 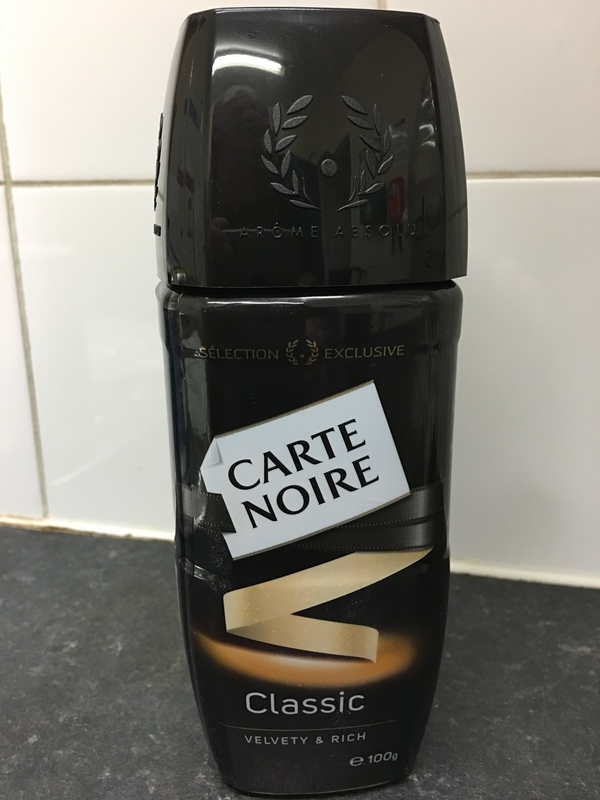 Mondelez Carte Noire Classic instant coffee. Made in the UK. Back label view. Photograph by author. Most of the big UK supermarkets, fortunately for the consumer, still stock many British made products and clearly label their own brand products too (the exception being Waitrose who now no longer bother to tell their customers where most of their products are made) and so by looking at supermarket packaging you can easily buy British produced foodstuffs. Unfortunately most coffee production in the last few years seems to have moved mostly to Germany, I assume following Nestle’s factory closures in the UK (see below). 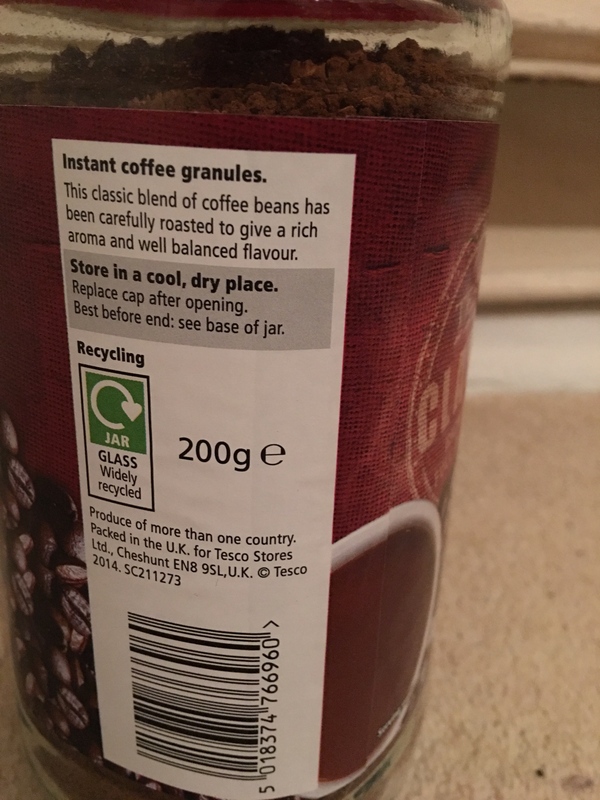 Tesco own brand Classic instant coffee. Produce of more than one country. Does not specicify where it is made specifically but abroad. Packed in the UK. Photograph by author. 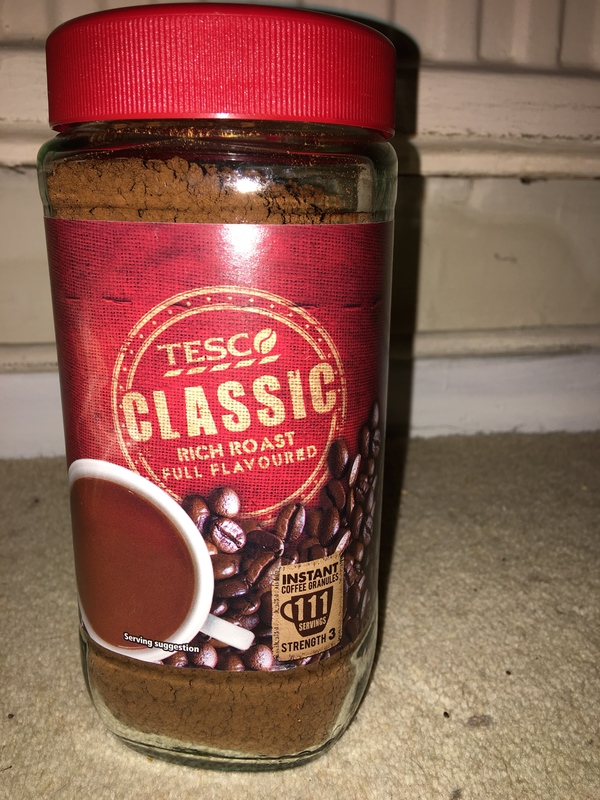 Tesco own brand Classic instant coffee. Produce of more than one country. Does not specicify where it is made specifically but abroad. Packed in the UK. Label view detail. 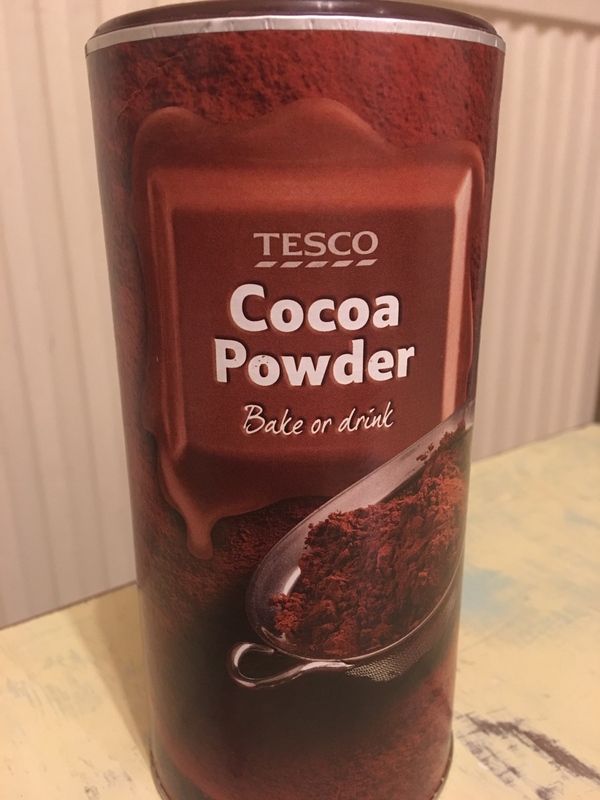 Tesco cocoa powder is produced in Italy and only packed in the UK. Front view. 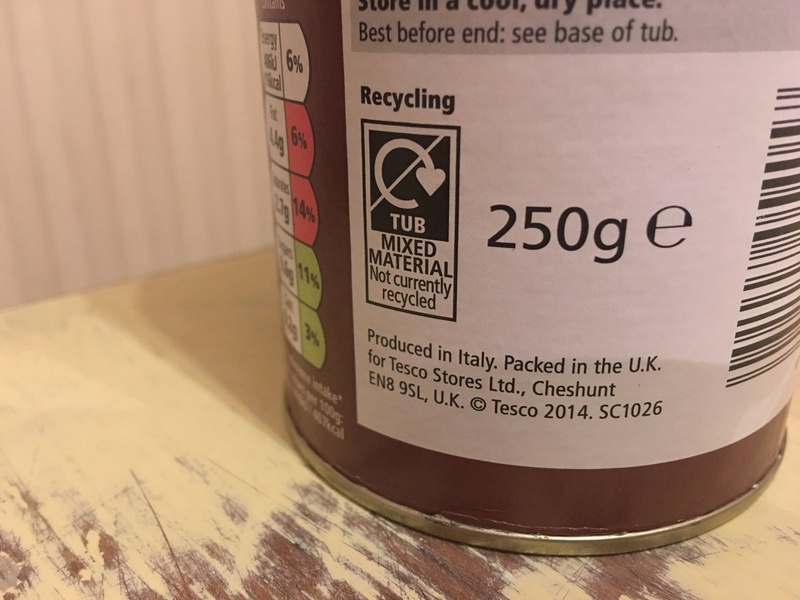 Tesco cocoa powder is produced in Italy and only packed in the UK. Label view. 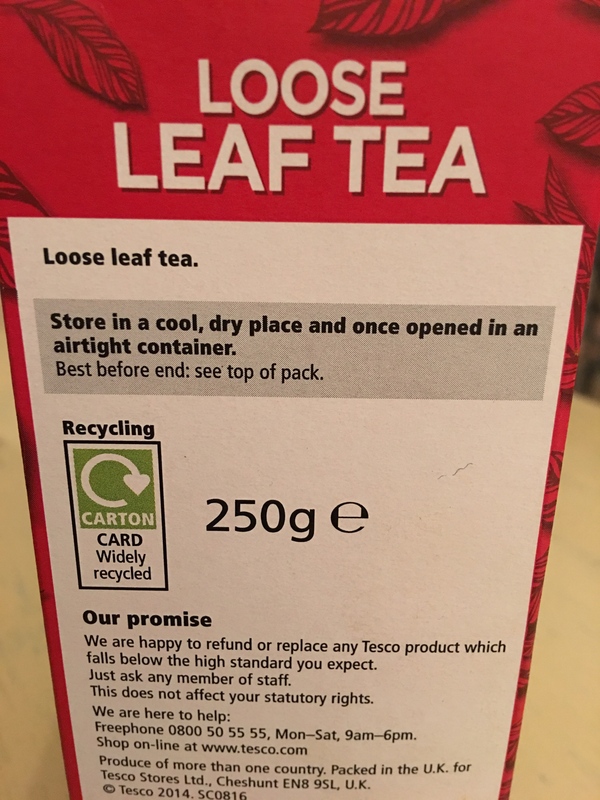 Tesco Original loose leaf tea is again produced abroad but packed in the UK. 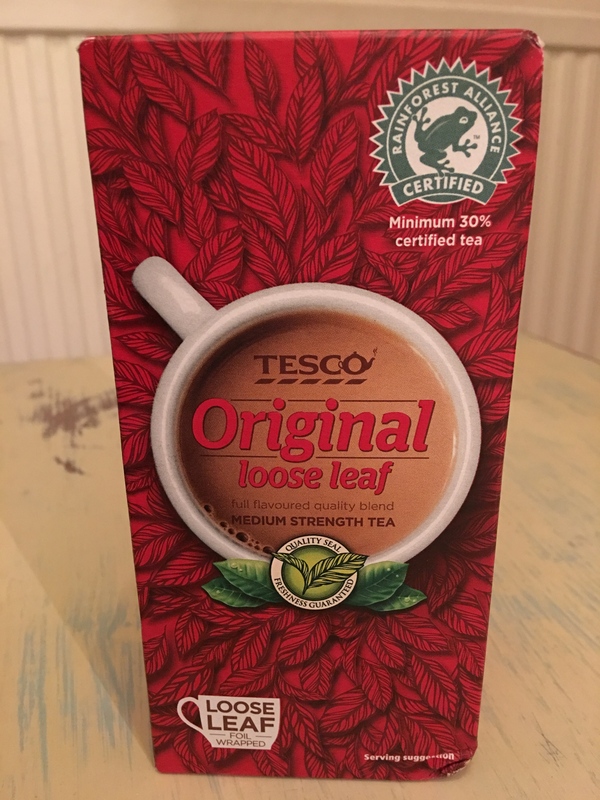 Tesco Original loose leaf tea is again produced abroad but packed in the UK. Label view. 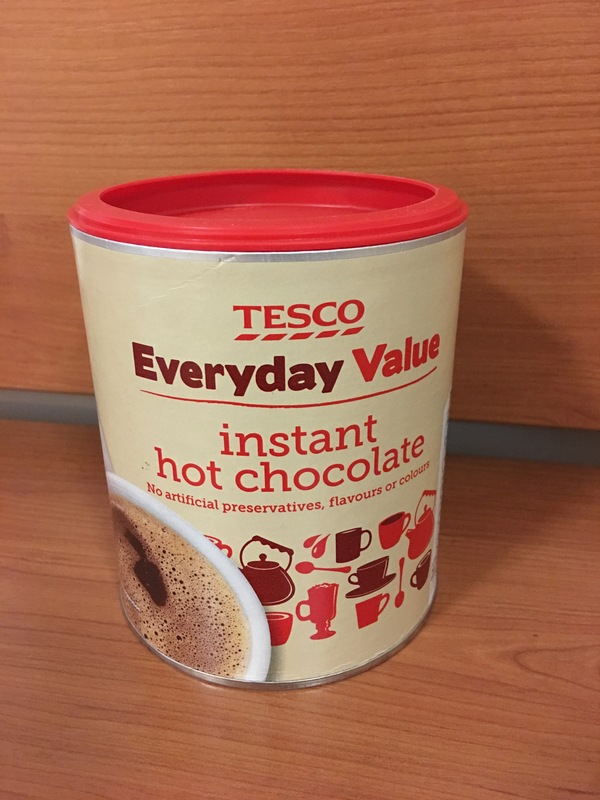 Tesco Everyday Value Instant Hot Chocolate. Produced in the UK. Front of packaging view. Photograph by author. 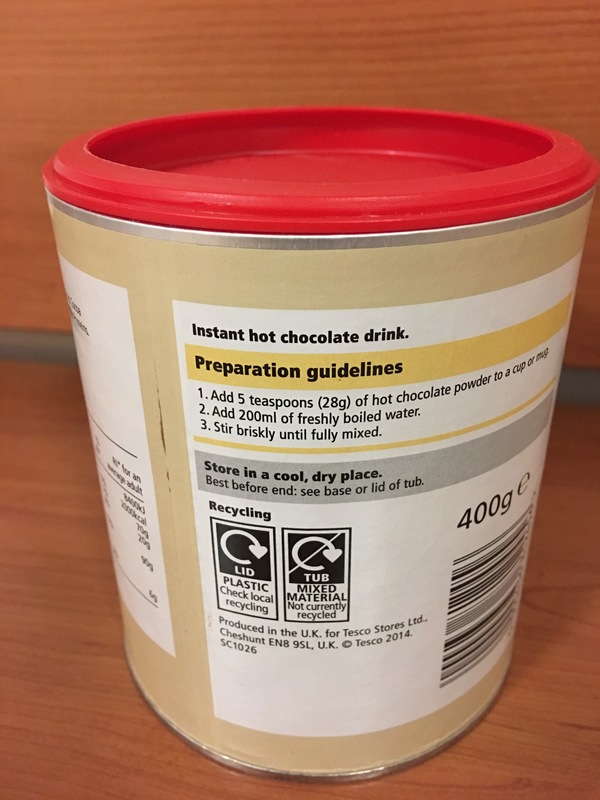 Tesco Everyday Value Instant Hot Chocolate. Produced in the UK. Rear of packaging label view. Photograph by author. 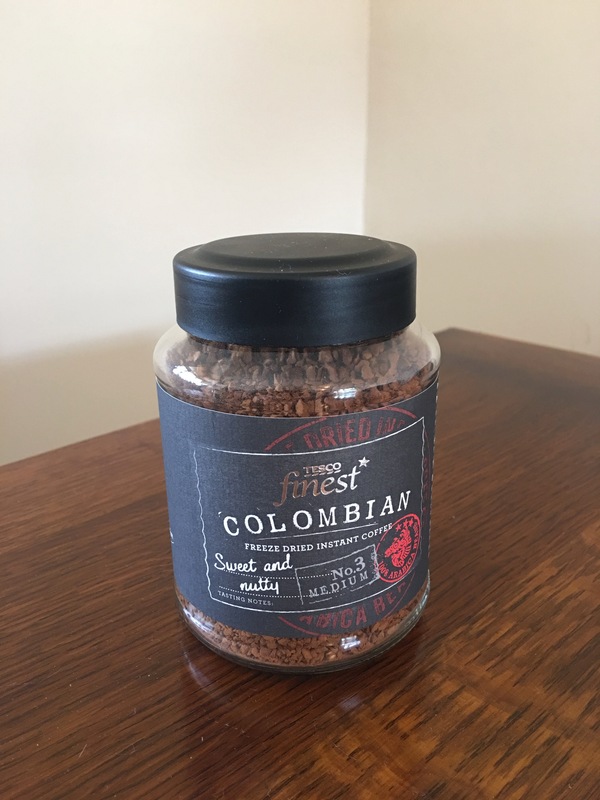 Tesco Finest Columbian freeze dried instant coffee. Produce of Columbia. Packed in the UK. I wonder where it is processed? Photograph by author. Front view. 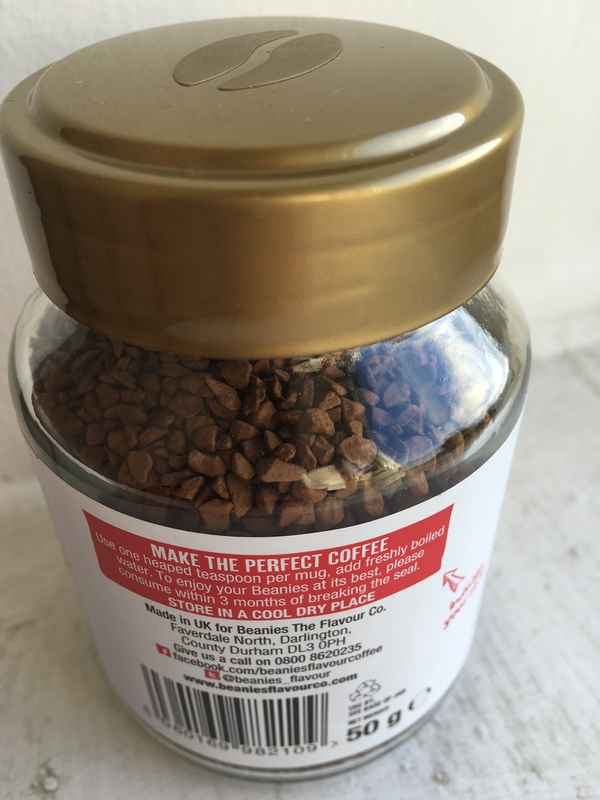 Tesco Finest Columbian freeze dried instant coffee. Produce of Columbia. Packed in the UK. I wonder where it is processed? Photograph by author. Rear label view. 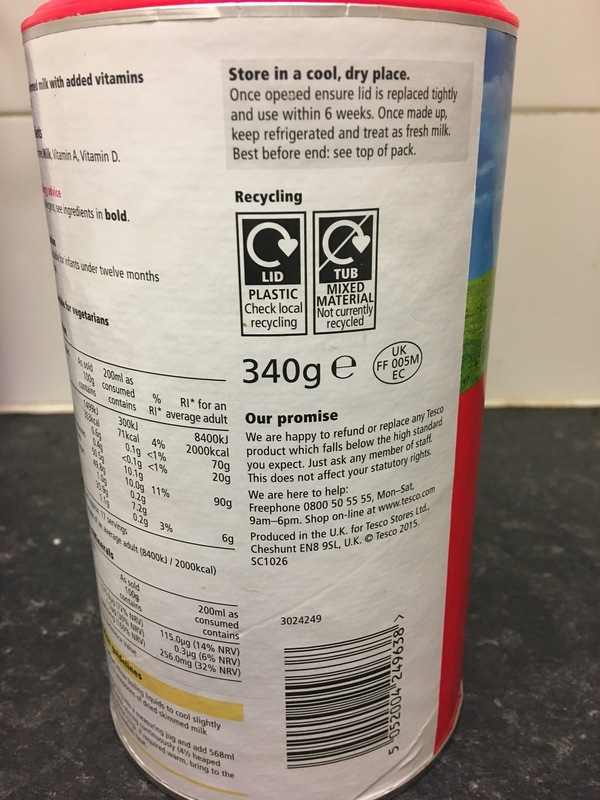 Tesco Instant Dried Skimmed Milk powder. Produced in the UK. Photograph by author. 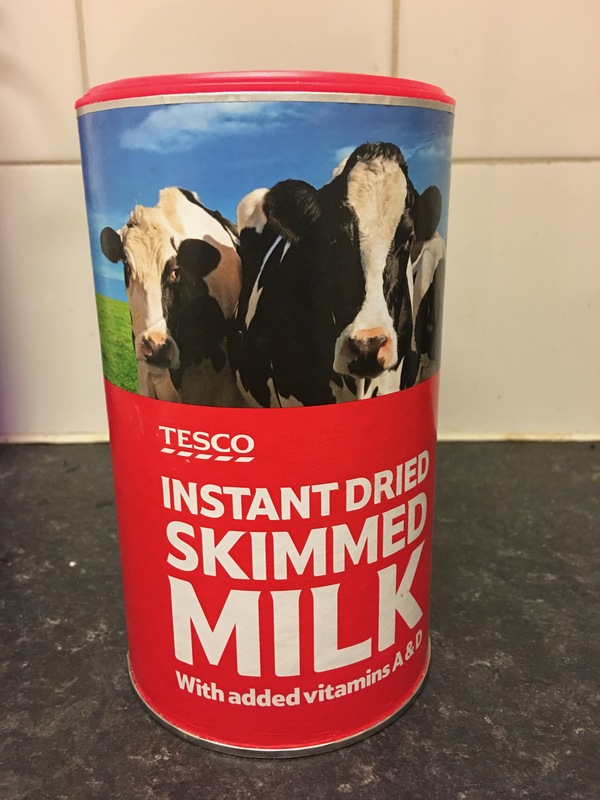 Tesco Instant Dried Skimmed Milk powder. Produced in the UK. Rear label view. Photograph by author. 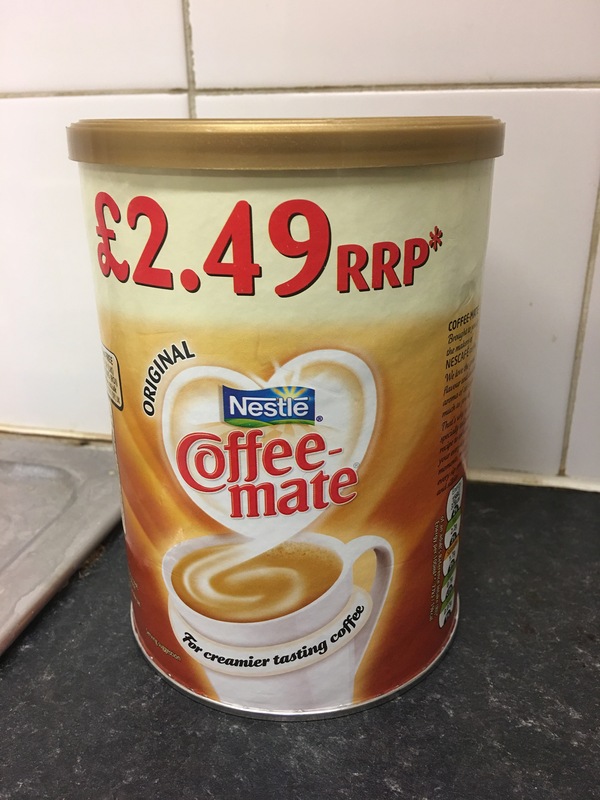 Nestle Coffee Mate Made in the UK. It is unusual for a Nestle product to give country of origin on it bur this Coffee-Mate does. Photograpgh by author 3 September 2017. 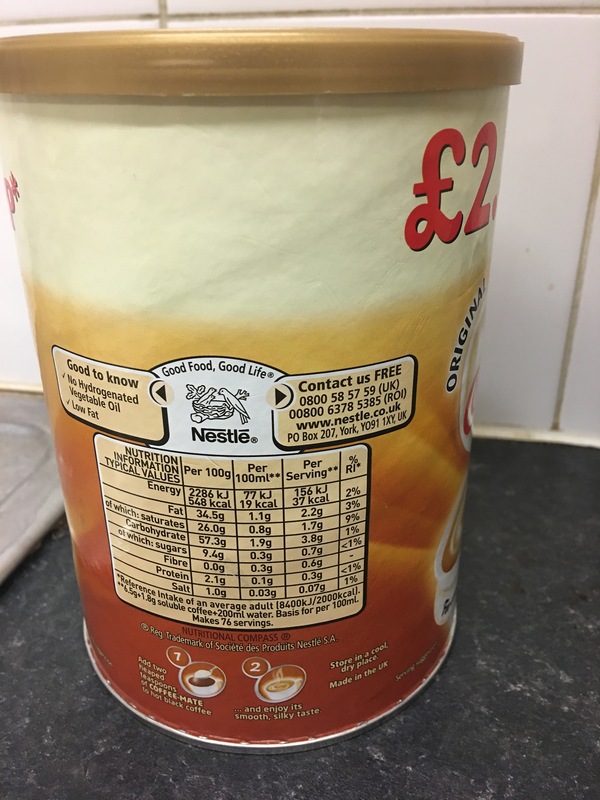 Nestle Coffee Mate Made in the UK. It is unusual for a Nestle product to give country of origin on it bur this Coffee-Mate does. Rear label view. Photograpgh by author 3 September 2017. For British made coffee and tea making machines, please see here. For British made mugs, teapots and suchlike, please see here. For more British produced foodstuffs, please see my Pinterest British Food and Drink page. This entry was posted in Food and Drink, Tea and Coffee and tagged Asda, Beanies, Betty's Tea, Bettys, British Made Tea, British Tea, Buckshot Coffee Co., Carte Noire, Charbonnel et Walker, Clipper Tea, Dorset Tea, East India Company, EIC Fine Foods, English Tea, Food and Drink, Fortnum and Mason, Hans Sloane, Jacksons of Piccadilly, Marks and Spencer, Nescafe, Nestle, New English Teas, PG Tips, Sainsbury, Smith Street Coffee Roasters, Taylors of Harrogate, Tea and Coffee, Tesco, The London Cuppa, Traidcraft, Tregothnan, Twinings, Twinings Tea, Waitrose, Waitrose Tea, Whittard of Chelsea, Yorkshire Tea on March 12, 2013 by ukmade.